Do You Fork or New York!!!! Go to goodfellas.com or vote right here!!!! 1000's of votes have been pouring in from the massive media coverage over NYC Mayor Bill DeBlasio's pizza eating technique! Be apart of the action by voting: " Do You Fork or do you New York"
STATEN ISLAND, N.Y. -- As a pizza was placed in front of the new mayor, he made a fateful move: He picked up a fork and knife. The press corps noticed almost immediately. Within moments, there was a Twitter hashtag: #forkgate. Mayor Bill de Blasio didn't stick strictly to utensils -- he sampled three slices (one marghertia, two "Smoking Goodfellas") and began with utensils for each, before switching to the more conventional New York handheld style for finishing. "In my ancestral homeland, it is more typical to eat with a fork and knife," the Italian-American defended himself. "I have been in Italy a lot, and I have picked up the habit -- for a certain type of pizza. When you have a pizza like this, it had a lot on it, you know, I often start with a knife and fork, but then I cross over to the American approach, and I pick it up when I go farther into the pizza." He summed it up: "It's a very complicated approach, but I like it." The pizza was fully loaded. The Smoking Goodfella comes with smoked mozzarella, roasted red pepper cream sauce, roasted red, yellow and green peppers, sausage and onions, and imported Pecorino Romano. "The smoked mozzarella was definitely the favorite," de Blasio said. And while there were plenty of more important issues discussed -- the struggles of small businesses, recovery from Hurricane Sandy -- how the mayor ate his pizza became the focus of a great deal of attention. "You're asking an Irishman," Assemblyman Michael Cusick said, "but an Irishman from Staten Island -- there's an asterisk there. I know my Italian food. I always eat my pizza with my hands." Said Italian-American state Sen. Andrew Lanza: "We'll give him a break. It's his first week on the job, but if we ever see it again, then we're gonna have to really sit down and talk about things." But the mayor found something of an ally in an unlikely person -- Minority Leader Vincent Ignizio. "They do so in Italy, as well," he said of the utensil use. 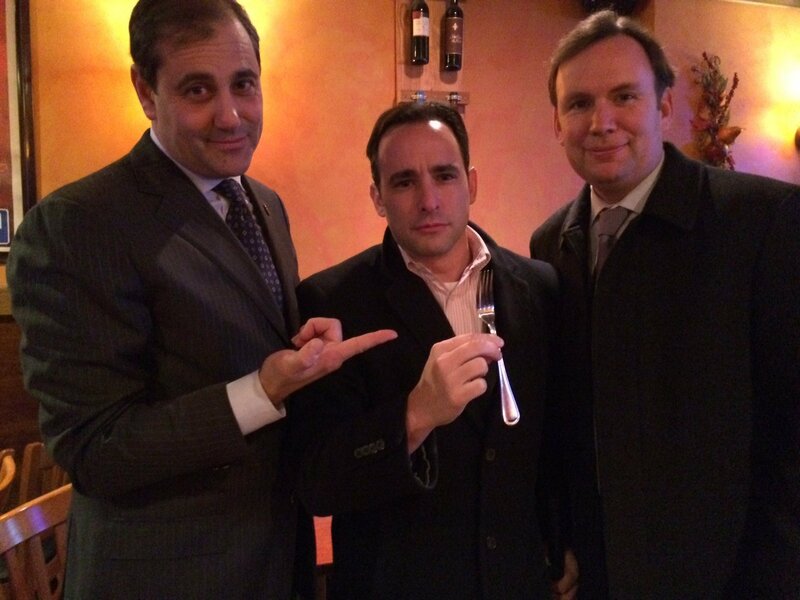 But that didn't stop Ignizio from trying to steal the very fork the mayor used in his controversial meal. "This is the exact fork de Blasio used," he joked, saying it ought to be hung on the wall. De Blasio called the meal part of the "Staten Island Pizza Challenge" -- he previously dined at Denino's, and promised at a Democratic gala here he'd be back to try Goodfella's. But he couldn't yet declare a winner. "I'm not in a position to pass judgment, because some of the elected officials of Staten Island have now insisted that other pizzerias be included," de Blasio said. "This challenge will continue, and I will not stop until I find the whole truth."